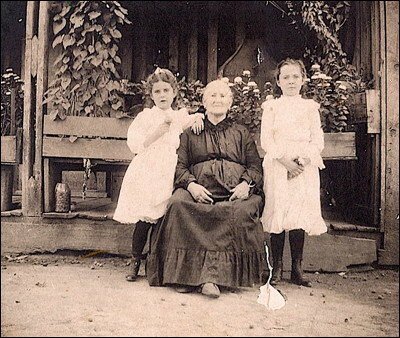 My grandmother Blanche Winnifred Rodgers (left) and her sister Ola May Rodgers (right) with their grandmother Martha Jane Rodgers (center) at the family homestead in southern Oregon in 1901. Blanche was my father's mother. This is one of only three surviving photos taken at the old homestead in Beagle. In 1970, I went looking for the homestead. After hours of wandering through the woods above Meadows Road, I found what was left: a foundation, a semi-intact wood porch, a few boards scattered around.... And flowers blooming everywhere! Roses and irises mostly. They had been planted by my great-great grandmother, and for all I know, they're still there today. I'm thinking I'll go have a look.